Simon and I each got a pair of these after reading about them in Matt Fitzgerald’s “Brain Training for Runners.” (Excellent book, by the way, and definitely my top pick on the recommended reading list for triathletes right now.) The premise is pretty simple – shoes are bad. Of course, shoes have become somewhat of a necessity these days with glass, dirt, gum, trash, rocks, and all of the other stuff that litters both city streets and (unfortunately) many trails. Enter Vibram’s FiveFingers “shoes.” I put that in quotes because I’m not actually sure what to call them. They are basically foot protectors more than anything. They allow your foot to move almost totally freely. You can wiggle your toes. And, more importantly, your toes can bend and flex and do all the things that toes are meant to do. I haven’t done any runs in them yet. I’m going to start on grass, and hopefully build up to being able to do a longish easy run in them. Even just walking in them feels great. If you are a dog walker (that means you, Mom), these are the way to go. As I’ve gotten more into running, I’ve become more convinced that shoes are, ultimately, a detriment to proper running technique. I’m not saying these are the right things for a race, but I do think that strengthening your feet should be a big part of everyone’s basic training. 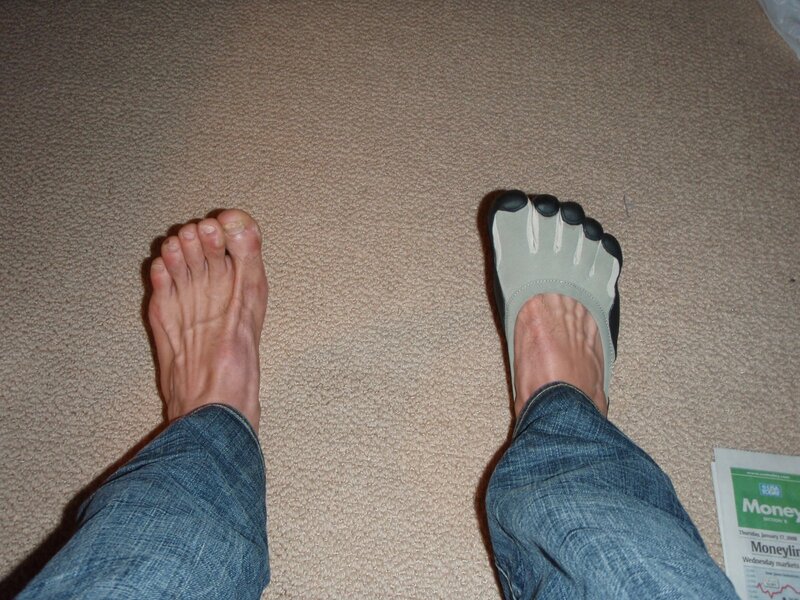 Everyone – court sport athletes, runners, hikers, and people who just want to be “fit” – should have strong feet. Our feet anchor us to the earth, and if we take care of our feet, they’ll take care of us. I’m certainly no runner, but I’ve been using these to travel in for a lot of the last few months. They’re great. I hope you enjoy yours. Ha! Welcome to the vibram club! Are you going to try and run in them? Thanks for the update Rappstar! Very informational.